Shaun made this workout video just one month prior to his 1990 Mr. Universe victory. He is in incredible shape as he goes through a grinding, mind blowing workout in his own gym. This explosive video ends with a great interview as a totally drained Shaun shares his secrets on training, diet and nutrition. Shaun “Dinosaur” Davis is a unique and wonderful character in English Bodybuilding history! He was a major star in NABBA winning 2 Universe titles before going on to have a good IFBB professional career. His career was cut short by illness and injury. Why was he called “Dinosaur”? It was for 2 reasons. Firstly Shaun was huge, and secondly, he was such a unique character, they simply do not make bodybuilders like this any more! He was truly a dinosaur of bodybuilding for his time. Shaun made this workout DVD just one month prior to his 1990 Mr. Universe victory. He is in incredible shape as he goes through a grinding, mind blowing workout in his own gym. This explosive DVD ends with a great interview as a totally drained Shaun shares his secrets on training, diet and nutrition. This workout isn’t staged for the camera as it honestly and candidly reflects how a champion actually trains, one month out from the Universe. See how this blond and charismatic English physique star really attacks the heavy weights. Shaun is 6′ tall and usually competed at a ripped 240lbs bodyweight. We would like to thank UK videographer Vaughan Jones for shooting this feature for GMV. Wayne did shoot every appearance that Shaun made in the NABBA Universe and NABBA Worlds and in some of his IFBB Pro shows. These DVDs are highlighted in the Contest History below. 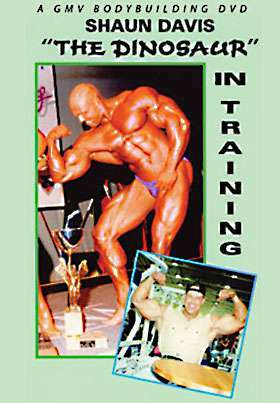 The photos shown on the cover above are purely to illustrate the great physique achieved by SHAUN DAVIS as no workout photos were taken during the shooting of this DVD.